Prakash Bhende has been a painter for more than 40 years. He specializes in fresco style paintings. Frescoes are inscribed cave paintings prevalent since 5th century. 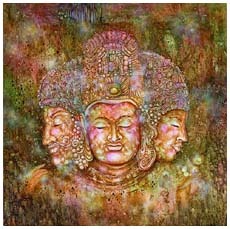 The caves of Ajanta & Ellora are fine examples of Fresco painting. Surprisingly, 45 years ago when Prakash Bhende had just heard of Ajanta/Ellora and cave temples in India, he discovered that his paintings had close resemblance with those present in this caves. 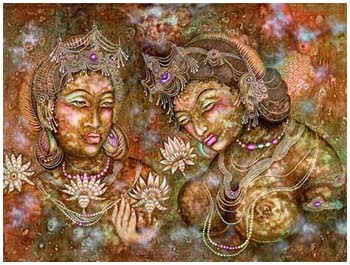 Being a versatile painter he decided to specialize on Fresco Style art technique and began his own study of cave temples of India. Prakash Bhende has worked as Chief Designer for major Textile Companies such as Garden Silk Mills, Reliance Group, Standard Mills, Vijaylin & Ellora Silk Mills. He held his First Solo Exhibition of Paintings at Chetna - Jehangir Art Gallery which was inaugurated by Shri Acharya Atre. In 1978 he Introduced the Multi-colour screen printing on Sunmica for the first time in India for Caprihans Ltd. and Standard Laminates. In 1979 he Started a Film Production and Distribution Company. Since then he has produced and directed six well-known Marathi Feature Films. The Maharashtra State Government awarded him for Best Art Work in the 1992. He has held several one man shows and his works are in the collections of Garden Silk Mills,Swarup Group of Industry, Goyanka Group of Industries and many others. 1967 - He Started career as a Painter. 1962 - He was Chief Designer for major Textile Companies viz. Garden Silk Mills, Reliance Group, Standard Mills, Vijaylin & Ellora Silk Mills. 1968 - He held his First Solo Exhibition of Paintings at Chetna Jahangir Art Gallery which was inaugurated by Shri Acharya Atre. 1978 - Introduced the Multi colour screen printing on Sunmica for the first time in India for Caprihans Ltd. and Standard Laminates. 1979 - Started Film Production and Distribution Company. Since then produced and directed Six well known Marathi Feature Films. A Well known and respected personality in Marathi Film Industry. 1992 - Maharashtra State Government Award for Best Art Work. 2006 One Man Show on 3RD July 2006 in The Nehru Center, London which included special painting collection of paintings on Buddha being a celebration of 2550th year of Buddha’s Mahaparinarvana. (Enlightment Year). 2006 Solo show as a residential artist in Agora Art Gallery, New York, U.S.
2005 One Man Show on 21st January 2005 Exhibition at Leela Art Gallery, Sahar Airport, Mumbai for Tsunami relief fund which was inaugurated by Mr. R.R.Patil, Dy. Chief Minister of Maharashtra. 2004 One man show titled "Flash Back " at Nehru Center Art Gallery, Worli, Mumbai which was inaugurated by Shri Balasaheb Thakare. 2006 Participant in Harmony Art Show 2005 of Harmony Foundation, Mumbai. 2005 Participated in Monsoon Show organized by Nandan Arts with a group of 60 renowned Artist form India held at Nehru Art gallery, Mumbai. 2005 Participant in Auction held for Flood Affected Victims held in India Art Gallery, Pune. 2005 Participated in Ganesha's Exhibition in Mumbai Art Gallery, Mumbai.